Probate Real Estate In California: What you don't know can hurt you. Everyone should have will or plan. Even if you have not made out a will or a trust, you still have a plan – a plan dictated by the Probate laws of the state where you reside upon your death. Making a will is not a way to avoid “probate”, the court procedure that changes the legal ownership of your property after your death. Probate makes sure it is your last valid will, appoints the executor named in your will and supervises the executor’s work. You can do several things now that can help your executor and family later, hopefully much later on. 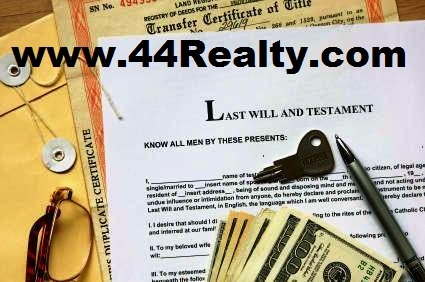 Question: I am in possession of a will that distributes the decedent’s estate to me, isn’t this all I need? Question: What does “probate” actually mean? Answer: Generally, probate is a court proceeding that administers the estate of an individual. Question: What is the purpose of “estate administration”? Question: Can real estate be sold while “in probate”? Answer: Yes. Without getting into too much detail it can be sold either at private sale in which the executor of the estate negotiates a transaction with a buyer or at public sale in which the property is sold at public auction. Question: If there is no will, how is the property of the estate distributed? Answer: Sections 6400 through 6414 of the California Probate Code addresses intestate succession and the distributions. The method and manner of intestate distributions is quite complex and therefore one should specifically discuss intestate distributions with his or her legal advisor. The process of selling real estate through probate or trust is a court-regulated series of steps that must be continually monitored and managed. Deadlines are tight and unforgiving. Documents are specialized for the field of probate. The Court’s oversight must be honored throughout all phases of the process: the marketing, offers, negotiations and final closing of the property.